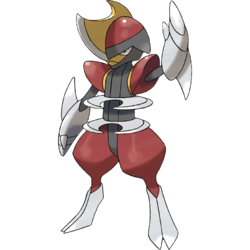 Bisharp in game: 694 Who? Important notice! 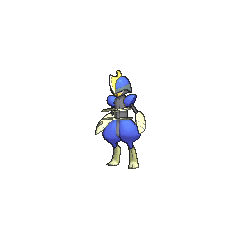 Pokemon Bisharp is a fictional character of humans. Bisharp (Japanese: ????? 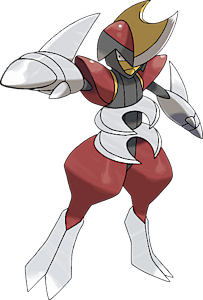 Kirikizan) is a dual-type Dark/Steel Pokémon introduced in Generation V.
Bisharp is a bipedal, humanoid Pokémon. It has a round, red and black head, similar to a war helmet, topped with a golden, double-headed axe blade. Its face is primarily yellow with a black outline. The helmet shrouds most of its yellow-and-black face, although its triangular eyes are visible. Resembling shoulder pads, its red shoulders project slightly over its arms and have a thin yellow line where they meet its black torso. 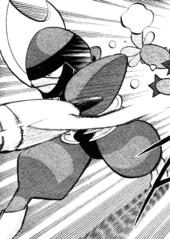 It has white, metallic hands that resemble gloves, with retractable, blades attached. Encircling its torso are two blades, which compose the impression of a ribcage. Its thighs are red and become progressively thinner as they connect to the knee. Both of its feet are metallic and split down the middle, resembling cloven hooves. These hooves are also similar to steel war boots or possibly leggings. In the wild, Bisharp rules over a pack of Pawniard, and fights other Bisharp to become the alpha of the pack. The loser of these fights is cast out. When hunting, the Pawniard allow the leader Bisharp to perform the finishing blow. Bisharp made its anime debut in Search for the Clubultimate! and A Clubsplosion of Excitement! under Georgia's ownership. A Bisharp appeared in Team Eevee and the Pokémon Rescue Squad!, under the ownership of Davy. A Bisharp, under the ownership of Bryony made its first appearance in From A to Z! and then reappeared in Meeting at Terminus Cave!. A Bisharp appeared in The Legend of the Ninja Hero! and A Festival of Decisions! under the ownership of Heidayu. A Bisharp appeared in Finals Not for the Faint-Hearted!, under the ownership of Alain, where it was used in the final round of the Lumiose Conference against Ash. A Bisharp appeared in Ash and N: A Clash of Ideals! under the ownership of a Team Plasma Grunt. 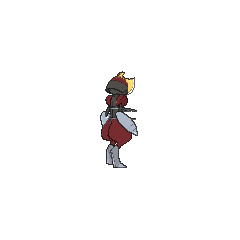 A Bisharp appeared as a mask for the festival in Capacia Island UFO!. A Bisharp appeared during a flashback in The Redemption as one of the many Pokémon fighting in the great war of Kalos, 3000 years previously. Grimsley has a Bisharp that first appeared with him on Route 4 where it helped him play card flip with the workers there. Kirikizan may be a combination of ???? kirikizamu (to mince) and ? zan (to cut or slay).